The caterpillars of monarch butterflies eat only milkweeds. Without milkweed plants we would have no monarchs. Milkweeds are the only host plant for monarch butterflies and play a critical role in their lifecycle. 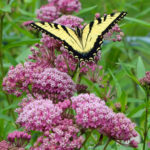 Adult butterflies lay their eggs on milkweeds and when the caterpillars hatch, they eat the leaves and other plant parts. One factor in the alarming decline in monarch populations in recent years is thought to be a precipitous decline in Milkweed throughout North America due to habitat loss. 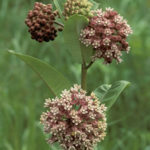 Without milkweeds throughout their spring and summer breeding areas, monarchs would not be able to produce the successive generations that culminate in the migration to overwintering grounds each fall. 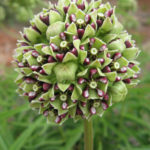 Milkweeds are native perennial wildflowers that also support a tremendous range of biodiversity – pollinators – butterflies, moths, bees – with abundant high-quality nectar, as well other insect species that rely on milkweed for nutrition. 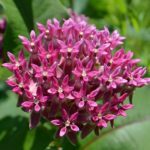 By incorporating native milkweed plants into your landscape with one or more of the following species native to the Midwest, you can do your part to restore monarch habitat and help sustain and support monarch butterflies. 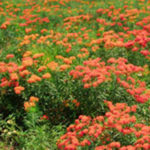 Bright orange, flat-topped flower clusters June through July. Plants bloom for many weeks. Host plant for the monarch butterfly and a great nectar source for many other butterflies and pollinators. Tall stems with large, light green leaves. The summer flowers are a magnet for insects of all types. 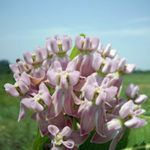 Large, round heads of pinkish-purple, fragrant flowers are held at the tips of the stems. Large seed pods form in late summer and disperse fluffy seeds that float through the air in fall. It is a larval host for the monarch butterfly. Green-yellow rounded flower clusters, often nodding. Grows on prairies, glades and along roadsides. Sweetly-scented spherical clusters of purplish burgundy flowers bloom in early summer. Grows naturally in open woodlands and between roadsides and woodlands. 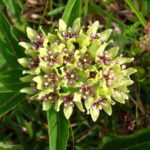 Similar to common milkweed in flower and leaf shape, but more compact and colorful. Earliest spring blooming milkweed with large yellow and green flowers and purple centers. High value butterfly nectar source. Host plant for monarch caterpillar. 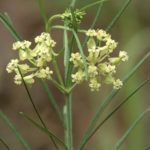 Clusters of greenish-white flowers appear from late spring through summer, in loose heads over attractive, thread-like foliage. The plants are upright and sparingly branched. Seed pods are narrow, unlike many other milkweeds, and about 3″ long. The whorled name refers to the foliage that arises from the stem in a whorl.